Simple and thoroughly decadent, these wonderful French-style truffles are a chocoholic’s dream come true. 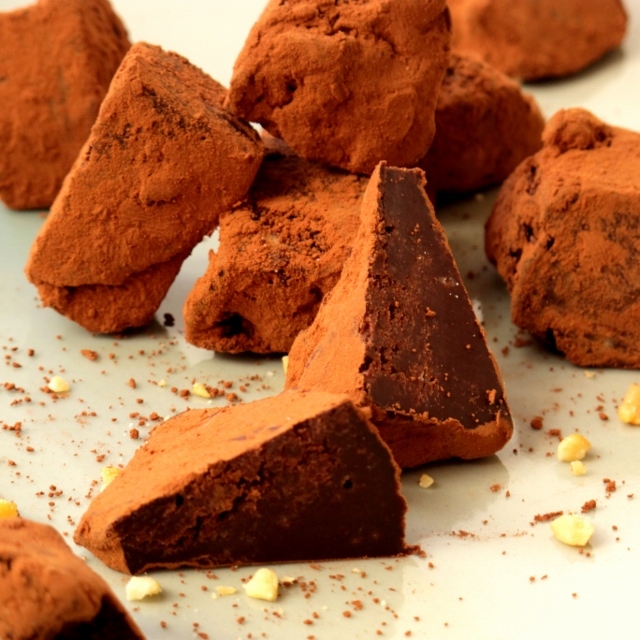 The ultimate bittersweet nibble, these truffles work well as a final flourish to a dinner party with a glass of cognac, port or even as a sneaky chocolate treat to be had when nobody’s looking. I first had these truffles many years ago when I moved to Cape Town. My dear friend Eloise made them for me once as a thank you gift for inviting her family to dinner one evening. As it was the first time I had met her she was blissfully unaware that I’m lactose intolerant so I just passed the thoughtful gift on to my partner (who is a chocolate-fiend of note) and didn’t think about them until the next day. As it turned out, the truffles weren’t to my partner’s taste at all as they weren’t as sweet as he would have liked. More surprisingly, however, they turned out to be right up my street! I’m not normally a ‘sweet’ person, but every now and again there are exceptions to the rule and these are most certainly that – exceptional! Bitter, sweet and with a hint of whisky; these little chocolate gems are most definitely worth the consequences of lactose intolerance and that’s not something I say lightly.